Mr. Adi Carmi served in the Israel security forces for 28 years. From 1985-1991 he served as a soldier in a select combat unit and upon completing an officers' course then served as an officer in a top-notch infantry unit, achieving the rank of captain. In the course of his military service he served as a commander in many complicated operations, including raids in Lebanon, the Gaza Strip and the West Bank. During the period 1992-2014 he served in the Israel Security Agency (ISA) as a direct continuation from his military service. He underwent training to become proficient in the Arabic language and became operational as an operator of agents. 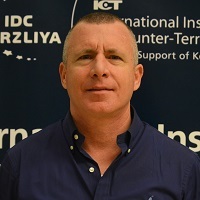 Mr. Carmi fulfilled several frontline positions including in counterespionage, in anti-terrorist activity in the Arab sector both in the Gaza Strip and the West Bank and in a variety of classified command posts. In the course of his service in the ISA, Mr. Carmi served as Head of Security at the Israeli Embassy in Ankara, Turkey from 2005-2007 and then at the Israeli Embassy in the Hague, Holland from 2007-2009. He retired from the ISA in 2014 after serving in a senior position in counterterrorism in the Arab section. Among his professional achievements, Mr. Carmi is a graduate of officers' training school and company commanders' course in the IDF. He also completed several courses in the process of his service in the ISA including courses dealing with advanced command and senior management. He has a bachelor's degree in social sciences and a master's degree in law from the Bar Ilan University. Since retiring from the ISA, Mr. Carmi has engaged in several senior positions in the business world. Currently he is the CEO of Security company. and also the chairman of a volunteer organization for youngsters at-risk. Mr. Carmi appears frequently on the leading channels of Israeli television as a commentator regarding matters dealing with terrorism.